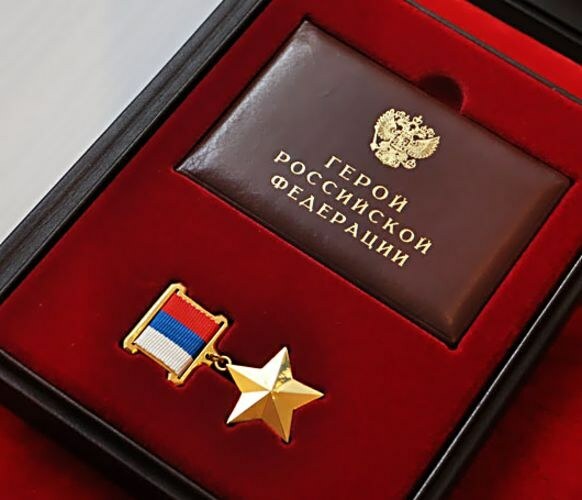 The title of "Hero of Russia" is the highest rank, which is awarded for services to the state and the people, if they were connected with the Commission of the heroic deed. To date, this title is received 1012. In addition to the title of "Hero of Russia", awarded, and special a special sign of distinction. This is the medal "gold star". It is a five-pointed star with smooth dihedral rays on the obverse. The length of each beam does not exceed 15 mm. the reverse side is smooth, the contour is limited to a thin rim. On the flip side raised letters read "Hero of Russia". The medal is connected using the eyelets and rings with a metallic gold Shoe. It is a rectangular plate, which is a moire three-color ribbon. The tape depicts the tricolor Russian flag. The medal itself gold, and it weighs just over 20 g.
Established the title of "Hero of Russia" for the first time in 1992. Then a law was passed, which approved the special sign of distinction – the medal "gold star". This law States that the title of "Hero of Russia" is awarded only once. Assigns it to the President of the Russian Federation. Awarded this award during his life and posthumously. And given she's not only military people but also ordinary citizens who have committed a deed in the name of people and country. The title of "Hero of Russia" is a separate kind of state awards. This is the highest reward that in the list of state awards of the Russian Federation is the Supreme place. It is noteworthy that after the assignment of this title, the birthplace of the hero is set a bronze bust. However, for this to be published the corresponding decree of the President of the Russian Federation. What feats give the title "Hero of Russia"? The lists of awardees there are, for example, combatants involved in repelling the invasion of militants in Dagestan. Further, it is the soldiers and officers involved in the Second Chechen war, which prevented the invasion of the gangs in the Republic. Was awarded the medal "Hero of Russia" 175 people for participating in the fighting in the First Chechen war. 108 people have received this award, ironically, for participation in the great Patriotic war. 87 people received the title "Hero of Russia" for the test aircraft. Many of them, unfortunately, died. Was given this award and those who fought terrorism in the North Caucasus. 44 astronaut also received this award. She was given to sailors and submariners, and test of marine equipment. In addition, the star of "Hero of Russia" received the participants of the October events in Moscow in 1993. Among the winners there are participants of military actions in South Ossetia, rescuers, involved in the fighting in Tajikistan, senior officials of various departments and ministries, the intelligence service personnel, athletes and travelers, participants of the Afghan war, liquidators of the Chernobyl accident and many others. Of course, that the main criteria for the assignment of the title are courage and heroism shown by the people in a given situation. Thanks to these feats, not only the Russian Federation but also other countries can live in peace and harmony. Of course, more than 30 % of the recipients, received this title posthumously, but in most cases, the reward has found a hero in life.